Bizarre-The village of Nagoro on the Japanese island of Shikoku was once a vibrant community, but due to lack of work attracted a lot of residents to Osaka or Tokyo. Also Ayano Tsukimi left, but in later years, she returned to her father. To the emptiness, which they found to fill them, makes them life-sized dolls. in the Past, there were some three hundred people in Nagoro. Now employs the village barely 27 residents. But lonely they feel. Ayano Tsukimi has made already more than 350 dolls. The first, which she sewed to the example of her father, then she made the others that her family and friends in the village think. Life-size dolls standing in the field, in a school or on a bench. They are everywhere in the village. 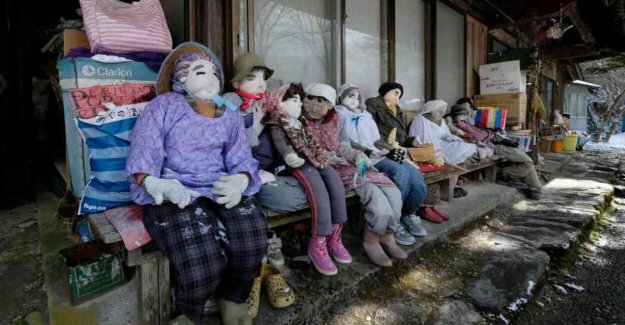 The bizarre hobby of Ayano gave the village the nickname ‘Valley of the Dolls’ or ‘Scarecrow Village’. In 2010, Japan still 128,5 million people, but today, the population has dropped to 126,8 million people. Approximately 94 percent live in cities. Even villages are a problem for Japan: young people move away and older people die.